Brittany Ferries will charter two new cruise-ferries to serve its long-haul UK to Spain routes in 2021. The latest investment underlines the company’s commitment to Portsmouth and to its Spanish routes. 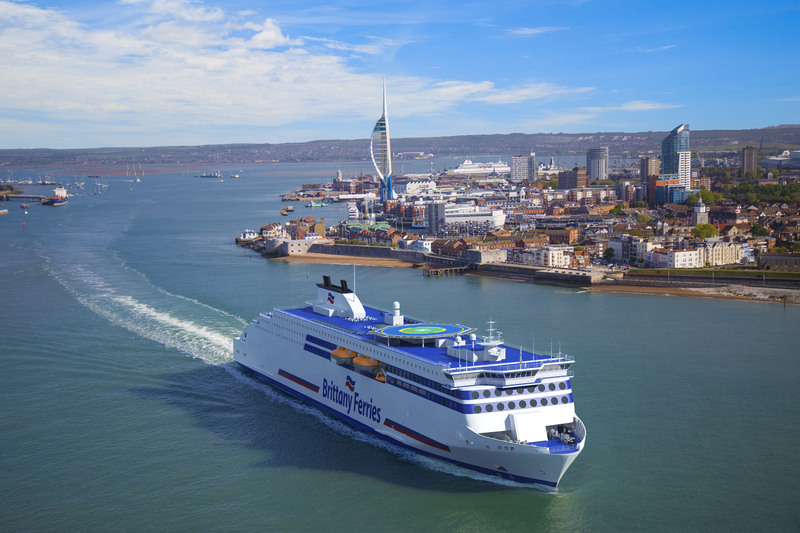 It comes after work began this spring on a new LNG cruise ferry called Honfleur to serve its most popular Portsmouth – Caen crossing. Like Honfleur, which arrives in 2019, both new ships will be registered under the French flag and will be crewed by French seafarers. Both new ships will be built at the Avic International Weihai shipyard in China. Together the three ships will spearhead a wide-ranging, five-year fleet-renewal and modernisation programme worth around £400m. Portsmouth is Brittany Ferries’ UK hub and will serve as the base for both ships. Upon arrival they will cater for an ever-increasing demand for long-haul ferry travel to Spain. In 2017 the company operated 844 sailings on routes from Portsmouth, Poole and Plymouth to Santander (Cantabria) and Bilbao (Basque Country), carrying 331,000 passengers and 150,000 cars. That was around 80 per cent more than ten years earlier. “Spain is by far the most popular foreign destination for UK holidaymakers, and we have seen significant growth in demand,” said Jean-Marc Roué, Brittany Ferries’ president. Last year, Brittany Ferries carried around 40,000 freight units from UK to Spain. Lorry drivers are able to relax as the sea takes the strain, reducing fuel costs, tolls and road pollution that comes from driving long-haul through France. Measuring 42,400 tonnes and 215 metres long, the new vessels will be the longest in Brittany Ferries’ fleet. If Portsmouth’s Spinnaker Tower were laid on its side, each would outstretch it by 45 metres. These impressive dimensions will allow them to carry almost two miles of freight vehicles apiece. There will be plenty for passengers on board. Three spacious passenger decks will host boutiques, a café, restaurant, bar and an exclusive club lounge. Around 300 en-suite cabins will cater for approximately 1,000 passengers and many will be adapted for customers with disabilities, as well as those travelling with their pet dog or cat, Brittany Ferries carries around 70,000 annually. Elegant décor will ensure everyone feels in the holiday mood as soon as they step on board. Brittany Ferries will be working with Spanish interior designers to give the ships a stylish, modern feel and feel, evoking the golden coasts, verdant landscapes and vibrant towns of España Verde (Green Spain) on the northern coastline. The announcemed investment follows the launch of the first ever direct ferry service linking Ireland with Spain in April. Brittany Ferries’ Connemara made its first call into Santander from Cork on 9 May 2018 and this year also marks 40 years of continuous services linking Britain with the Iberian Peninsula. Since 1978 more than 5.5 million passengers have enjoyed Spain without the ‘plane thanks to Brittany Ferries.